In The Politics of Autism, I discuss health care issues and state Medicaid services for people with intellectual and developmental disabilities. Mitch McConnell has postponed the Senate vote on Trumpcare. 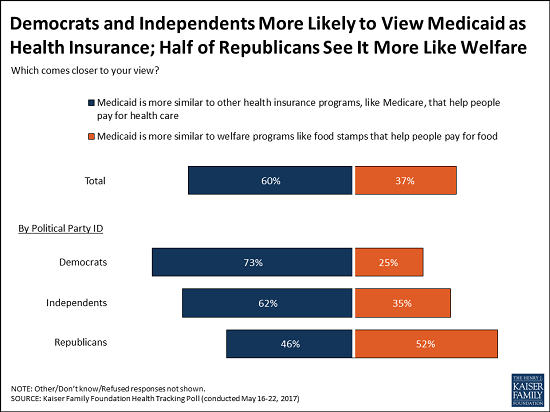 One reason for the bill's extreme unpopularity is its impact on Medicaid. 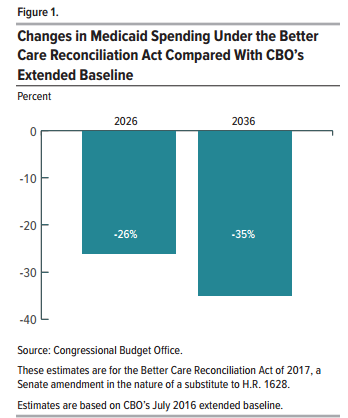 In the Congressional Budget Office’s assessment, Medicaid spending under the Better Care Reconciliation Act of 2017 would be 26 percent lower in 2026 than it would be under the agency’s extended baseline, and the gap would widen to about 35 percent in 2036 (see Figure 1). Under CBO’s extended baseline, overall Medicaid spending would grow 5.1 percent per year during the next two decades, in part because prices for medical services would increase. Under this legislation, such spending would increase at a rate of 1.9 percent per year through 2026 and about 3.5 percent per year in the decade after that. Christina Samuels writes at Education Week about studies of voucher programs in Indiana and Louisiana. Voucher students showed no academic gains in their early years of enrollment, and sine lost ground. MORE DETAIL HERE. [S]pecial education students in the study performed worse than students in the study as a group; they saw academic achievement losses in English/language-arts as well as in math. The Indiana voucher program requires that parents of children with disabilities and the private school agree on a "Choice Scholarship Education Plan" that has some similarities to the individualized education program that is required under the IDEA. However, IEPs are much more comprehensive and are intended to meet the student's legal right to a free, appropriate public education. The chance of a voucher student being newly identified as having a disability was slightly lower than the control group rate. ADVOCATES: Keep the pressure on! The vote on the Better Care Reconciliation Act in the United States Senate has been delayed thanks to advocates like you who wrote to #SaveMedicaid. Autism Speaks has serious concerns with changes the bill would make to Medicaid, the single most important insurance program for people on the spectrum. Please contact your Senators and ask them to ensure that services are not cut for children and adults with autism. Please SHARE this post with your friends and family and let us know you've contacted your senator in the comments below. Your advocacy is working. After Senators’ offices began to receive a new wave of calls and protesters, the Senate has postponed their vote on the Affordable Care Act repeal bill. This is a good sign – Senators are worried about how this bill looks to the people they represent. But if there’s one thing we’ve learned from fighting this bill in the House, it’s that we need to ramp up the pressure. The politicians working to repeal the ACA and destroy Medicaid won’t stop, so neither can we. This week and next week will decide the future of this bill. The other side will be negotiating, making deals, and doing everything they can to persuade more Senators to vote Yes. We need to make sure our voices are louder than the wheeling and dealing happening behind closed doors. Mitch McConnell has postponed the Senate vote on Trumpcare. One reason for the bill's extreme unpopularity is its impact on Medicaid. One mechanism to reduce per enrollee costs would be to restrict covered benefits. States could eliminate, restrict the scope or impose new or tighter utilization controls for “optional” services (those not required by statute). All states offer some optional services, including prescription drugs. Adult dental or chiropractic services are key examples of benefits that some states have restricted or eliminated during economic downturns. Nearly all home and community based long-term care services (HCBS) are also an optional service. (Figure 2) Over the last 2 decades, state spending for long-term care has moved from institutional care to home and community based settings. HCBS accounted for over half of long-term care spending by 2013. With restrictions on federal financing, an aging population and statutory requirements to cover nursing home care, states’ ability to invest in HCBS could be strained. The Republican plan for Medicaid is likely to hurt schools in several ways, said Sasha Pudelski, who tracks healthcare policy for AASA. [American Association of School Administrators] Most directly, states may decide to prohibit schools from receiving Medicaid dollars because of what is likely to be stiff competition against doctors and hospitals for limited resources, she said. Less directly, states struggling to cover healthcare costs now covered by the federal government would have to seek cuts elsewhere in their budgets, including in education, which accounts for a large share of many states’ spending. “The kids who will be hurt first and foremost are special ed kids and kids in poverty, but then everybody will be hurt, because we’ll have to shift dollars from the general education budget,” she said. Schools receive less than 1 percent of federal Medicaid spending, according to the National Alliance for Medicaid in Schools. But federal Medicaid reimbursements constitute the third-largest federal funding stream to public schools, behind $15 billion they receive each year for educating poor children and $13 billion they receive to educate students with disabilities under the Individuals with Disabilities in Education Act (IDEA). Under the House bill, California, which spends more than $100 billion a year on Medi-Cal, would have to replace about $24 billion in federal Medicaid dollars by 2027, according to the state Department of Health Care Services. Caps would vary depending on the type of enrollee and growth in those caps would be indexed to the rate of inflation. But the Senate bill eventually uses a general inflation measure, rather than one tied to medical expenses. That would lead to even deeper Medicaid cuts than the House bill, opponents argue. While children with disabilities are technically exempt from per-capita caps, “As soon as they turn 19, they would be affected by cut services,” Flory said. “There are also a number of children who are not categorically disabled but are receiving a high level of services due to trauma, et cetera,” she said. Palmetto Autism Intervention (PAI) in Columbia is closing on June 30. The center provides therapy like Applied Behavior Analysis (ABA), a treatment many consider critical for those with autism. The center is one of few that takes Medicaid patients. But they blame the slightly higher reimbursement plan for putting them out of business, saying a rise from $13.58 per hour to $17.28 per hour just isn't enough. Autism Speaks advocate and parent Lorri Unumb takes up for the treatment center. "They are people who spend their days sometimes being spit upon and sometimes scratched, and it’s a very, can be a very demanding job. These providers are being reimbursed at such a low rate that they literally cannot afford to serve Medicaid children," Unumb says. Mitch McConnell has postponed the Senate vote on Trumpcare. One reason for the bill's extreme unpopularity is its impact on people with disabilities. If you depend on Medicaid to supplement the cost of care for your special needs child, now is the time to reassess your long-term plans. Some 11.2 million children in the U.S. have special needs — and of these, nearly 5 million rely on coverage from Medicaid and its Children's Health Insurance Program, according to the Kaiser Family Foundation. Now, funding to those programs is imperiled as the House and Senate debate their health-care bills. The House proposal, the American Health Care Act, would reduce Medicaid spending by $834 billion from 2017 to 2026, according to the Congressional Budget Office. Meanwhile, under the Senate bill, known as the Better Care Reconciliation Act, federal spending on Medicaid would decrease by $772 billion from 2017 to 2026, according to the Congressional Budget Office. The bill phases out Obamacare's Medicaid expansion program. While Medicaid is the sole health insurance for low-income families, it also serves as secondary insurance for families of all income levels whose children have “medically complex conditions” that require life long specialized health care. Medicaid supports children with cancer, cystic fibrosis, diabetes and autism, among a long list of serious conditions. With Medicaid funding, children receive ventilators so they breathe, insulin to regulate their blood-sugar levels and behavioral health counseling to help them learn to engage with their families. Medicaid supports kids in school, too, providing additional learning support and therapists. Thanks to Medicaid, these children receive comprehensive and preventive health care services to keep them healthy and out of the hospital. Without it, many families would face bankruptcy. Or worse, children would suffer and not get the care they need. The proposed U.S. Senate version of the House’s American Health Care Act has been clear about one thing: Medicaid will be capped and cut. The legislation effectively would transfer all the financial risk to our state government — already running a budget deficit of more than $1 billion — which would be left to its own devices to figure out who gets help and who gets hurt. California: "You've got your heart strings and you've got your purse strings"
In 2013, the Kern High School District had 3,173 students with Individualized Education Programs. It's projected to serve almost 1,000 more next year. The Bakersfield City School District saw 64 new autistic students last year, bringing the total number of its special ed students north of 3,100 — a 4 percent increase over the prior year. Next year, KHSD is projecting the state will cover just 31 percent of the cost to teach special ed students, and the federal government less than 10 percent. That leaves KHSD footing the rest of the $73 million bill, or about $44 million, according to Niday. As bad as things are now, school officials fear they will get worse as U.S. Secretary of Education Betsy DeVos has proposed a $113 million cut to federal spending on special education programs. At The State, Jamie Self reports that there are long Medicaid waiting lists for ABA. Behind the delay is South Carolina’s lowest-in-the-nation reimbursement rate for the therapy, advocates and providers say. ▪ A 27 percent increase — to $17.28 an hour — that goes into effect July 1 will leave South Carolina still in dead last, trailing the rates paid by the second-lowest state by about $13 an hour. The national average is $43 an hour, according to Autism Speaks, a national advocacy group. ▪ Making matters worse, an expansion of the program next month to include older patients could add hundreds of children and adults to the list of Medicaid patients awaiting autism treatment. Of coruse, the problem will get worse if Congress carries out Trumpcare cuts in Medicaid. For many Americans, Medicaid means welfare, which means handouts to lazy bums. Opponents of Medicaid cuts have to show who actually benefits. If critics of Trumpcare want to move public opinion, they need to change the image of Medicaid as a handout to lazy, able-bodied adults. In particular, they need to show that many beneficiaries are people with autism and other disabilities. After months of whirlwind emotions, a Portland teen who won a trip to the United Nations, but then had the trip denied because he has autism, has learned that he will be able to go on the trip after all. Niko Boskovic, 15, finished first in an essay contest sponsored by North Portland's Peninsula Odd Fellows Lodge. As the winner, he was given the opportunity to join 300 other winners from around the world for next month's 10-day United Nations Pilgrimage for Youth in New York City and Washington, DC. with Disability Rights Oregon to advocate for his inclusion, the trip is back on. "We finally got all the details ironed out this week, and the issues have been resolved between the parties," said Loreta Boskovic, Niko's mom, noting that details of the agreement are confidential. Specialists who treat children with autism in Texas will soon be required to obtain licenses after Gov. Greg Abbott recently signed an amended version of Senate Bill 589 into law. The bill, by Sen. Eddie Lucio Jr., D-Brownsville, will require licenses for applied behavior analysts, therapists most known for their treatment of autism. After easily passing in the Texas Senate on May 1, the bill also swiftly passed in the House on May 23 before heading to Abbott's desk. "Because of the tireless work behind SB 589, our most vulnerable Texans who benefit from applied behavioral intervention - such as children with autism, along with those with developmental, intellectual, and physical disabilities, and with brain injuries - will now be protected by SB 589, which will reduce the probability and the possibility of them being harmed by unqualified practitioners," Lucio Jr. said in a statement. The bill's supporters have said a law is needed to regulate the profession. Texas has now joined more than 25 other states requiring licenses for behavior analysts. At Pacific Standard, David M. Perry explains why schools escalate behavior problems into law enforcement issues. But schools do punish people when they are panicking, and Sam Crane, an attorney and the director of public policy at the Autistic Self Advocacy Network, is afraid she knows why. Behavior intervention plans, she explains, are part of disability-rights education legislation. Once you have a plan, you have all kinds of added rights as a member of a protected class of American citizen. If you charge someone with a crime, though, schools can skip right past disability law. "Under the IDEA," Crane writes me, "[a] student would be entitled to a manifestation determination, to decide whether his behavior was a manifestation of a disability. There's no such requirement when referring a kid to law enforcement." Crane believes that, around the country, schools are pushing teachers and other staff to press charges. This study aimed to describe police interactions, satisfaction with police engagement, as well as examine correlates of police involvement among 284 adolescents and adults with autism spectrum disorder (ASD) followed over a 12- to 18-month period. Approximately 16% of individuals were reported to have some form of police involvement during the study period. Aggressive behaviors were the primary concern necessitating police involvement. Individuals with police involvement were more likely to be older, have a history of aggression, live outside the family home, and have parents with higher rates of caregiver strain and financial difficulty at baseline. Most parents reported being satisfied to very satisfied with their children’s police encounters. Areas for future research are discussed in relation to prevention planning. The assembled dads each had letters about the importance of Medicaid for their own children. Senator Alexander, Senator Corker, we gather here today as fathers, with Father’s Day mere hours away, to share with you our concerns with the course of action currently being set in Washington. We are fathers of children with disabilities. We are imploring you to vote to save Medicaid, and the other 'lifeline programs' that are currently facing unprecedented funding cuts. This is a course that, left unchecked, WILL have dire negative consequences for our sons and daughters. Whether they are young children, or adults trying to find their way in the world now that their school years are over, our sons and daughters face tremendous challenges because of disability. Challenges that most people … even fathers such as yourselves … can hardly imagine. Shouse spoke of his own experience, having a son with autism who benefits from Medicaid-funded programs. I am 33 years old and I have Aspergers Autism, executive function disorder and I suffer from depression and anxiety. I’m disabled on Social Security and Medicaid at the moment, I live alone but I get help with transportation and daily chores through an non-for profit called Wildwood. For most of my adult life, I’ve been unemployed and very depressed. However, in recent years because of therapy, support from wildwood, and my medication I’ve begun to turn my life around. I’m going back to school to earn a culinary degree, I have part-time employment at a local business and am I much happier, healthier person. Someday I want to get off disability, pay taxes, own a home and run a small business. However, without my medication and support at moment I can’t do this. These past few years have been the best of my adult life. I can see my goals getting closer and closer to fruition. But if the Trump health care bill goes through, none of this will happen. I will sink back into depression and in action. I need Medicaid and I need the support right now or I will stay in the system forever. According to the Center on Budget and Policy Priorities, 602,000 children in Missouri get their health care through Medicaid. This means that two out of five kids in our state are able to see a doctor when they are sick, get vaccinations and important screenings they need to stay healthy. The AHCA’s Medicaid provisions would make it especially hard for children with special health care needs, including those with disabilities, to get the care they need to stay healthy, remain in their communities, and succeed in life. Medicaid is a lifeline for children with disabilities and their families, serving 40 percent of all children in America with special health care needs such as autism. Alecia Deal, a community health worker in St. Louis and mother of three, relies on this lifeline for her 14-year-old autistic son. Without Medicaid, her son would not be able to receive therapy of any kind, psychiatric treatment or medications. In fact, he would be unable to attend his school for children with special needs because Medicaid pays for that as well. Pennsylvania U.S. Senator Bob Casey says the bill could trigger major cuts to Medicaid. The School District of Philadelphia, for example, could lose more than $11 million, and all told, Casey says Medicaid funding for the Commonwealth could be cut $135 million. He waved a letter he received from Pamela Simpson of Coatesville, whose 5-year-old son, Rowan, is diagnosed with Autism Spectrum Disorder, and ADHT. She shared her family’s story, with Rowan in tow. Simpson points out without Medicaid benefits, occupational, physical, and speech therapy, and medication would be inaccessible for her young son. Feber during pregnancy may raise the risk for autism spectrum disorder (ASD) in the child, according to a study led by scientists at the Center for Infection and Immunity (CII) at Columbia University's Mailman School of Public Health. The effect was most pronounced in the second trimester, raising odds for ASD by 40 percent. Risk of an ASD was increased by over 300 percent for the children of women reporting three or more fevers after the twelfth week of pregnancy. The study is the most robust to date to explore the risk of ASD associated with fevers across the entire span of pregnancy, and of the capacity of two different types of commonly used anti-fever medications—acetaminophen and ibuprofen—to address that risk. Risks were minimally mitigated among the children of women taking acetaminophen for fever in the second trimester. Although there were no cases of ASD among children of mothers who took ibuprofen, a nonsteroidal anti-inflammatory drug, researchers could not ascertain whether risk was mitigated due to the extremely small number of women using this particular drug for fever. Results of the study appear in the journal Molecular Psychiatry. The researchers followed 95,754 children born between 1999 and 2009, including 583 cases of ASD identified in Norway through the Autism Birth Cohort (ABC) Study. Mothers of 15,701 children (16 percent) reported fever in one or more four-week intervals throughout pregnancy, similar to rates reported in the U.S. ASD risk was increased by 34 percent when mothers reported fever at any time during pregnancy, and by 40 percent in the second trimester. The risk increased in a dose-dependent fashion from 1.3-fold with one or two fever episodes after the twelfth prenatal week to 3.12-fold with three or more episodes. “Our results suggest a role for gestational maternal infection and innate immune responses to infection in the onset of at least some cases of autism spectrum disorder,” says first author Mady Hornig, associate professor of Epidemiology and director of Translational Research at CII. Questionnaire analysis did not indicate an association between risk and maternally-reported symptoms of infection in individual organ systems that might implicate specific infectious agents. An ongoing study is testing blood samples collected at mid-pregnancy and at birth to explore the possible role of specific infectious agents and the contribution of distinctive patterns of immune response among mothers and children to understand the mechanisms creating vulnerability.